Marc Leepson is the author of the new book Ballad of the Green Beret: The Life and Wars of Staff Sergeant Barry Sadler from the Vietnam War and Pop Stardom to Murder and an Unsolved, Violent Death. 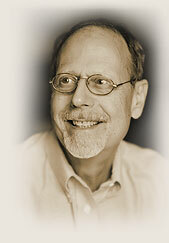 His other books include What So Proudly We Hailed and Lafayette, and his work has appeared in a variety of publications, including Preservation and Smithsonian. He lives in Loudoun County, Virginia. Q: Why did you decide to write a biography of Barry Sadler? A: I was going over ideas for my next book after I’d finished my Francis Scott Key biography, What So Proudly We Hailed, in the spring of 2014. A colleague, John Mort, had told me he was working on a proposal for a biography of Barry Sadler, but his literary agent wasn’t happy about it. I told John that if he decided not to go forward with the idea, I’d love to. A few months later, John emailed to say his agent talked him out of it, and kindly sent me a good amount of material he’d accumulated. I talked to my agent and he liked the idea so I began writing the proposal and he sold it. I am a Vietnam War veteran and have been writing about the war for more than 40 years for magazines, newspapers and websites. I had wanted to write about some aspect of the war in a book for some time but for one reason or another I wound up writing about other aspects of U.S. history. I did edit The Webster’s New World Dictionary of the Vietnam War, but that was a reference book. So that’s one reason I jumped at the chance to write Barry Sadler’s biography—because I also would be weaving in the history of the Vietnam War and the war’s legacy. A: I started with reading every secondary source I could find. That included four extensive magazine articles from the 1970s and 1980s. I got subscriptions to newspapers.com and several other newspaper archive websites and found tons of material on Barry Sadler, primarily from 1966-67 when he was famous. I interviewed 71 people, including folks he grew up with in Leadville, Colorado, men he served with in the Air Force and the Army, and friends from his post-military days. I also spoke at length to his wife Lavona, although their three children would not talk to me. His literary agent was a great source, as was the family lawyer and the homicide detective who investigated the Lee Bellamy murder. I learned an awful lot that surprised me—mainly because when I started the book, I didn’t know much more than the fact that he had the No. 1 pop song of 1966 and was an active duty Green Beret sergeant just home from Vietnam at the time. 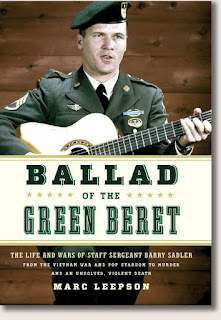 Q: How famous was Barry Sadler in the 1960s, and what do you think was the impact of his song "The Ballad of the Green Berets"? A: Barry Sadler went viral in 1966, 25 years before anyone uttered the word “Internet.” He had the No. 1 song for five weeks (and then for the entire year), sang on “The Ed Sullivan Show,” was the subject of a big spread in Life magazine, and in countless other magazines and newspapers—and appeared on many radio and TV shows. Someone said he was “the right man with the right song at the right time.” He was a handsome, self-effacing Vietnam War veteran with a pleasing voice with a patriotic song that resonated in the winter and spring of 1966 before the nation turned against the Vietnam War. Had that song come out a year later, it’s all but certain it would not have been anything close to the phenomenon it was in 1966. The song is an important part of the U.S. Army Special Forces (the official name of the Green Berets). It came along at a time when special warfare was new and controversial, and did a great deal to image of the Green Berets. It remains the unofficial theme song that’s played for SF trainees at Fort Bragg. It’s heard at Green Beret reunions—and at funerals of Green Berets. Q: How would you describe Sadler’s attitude was toward the Vietnam War? A: He was very hawkish. He was a true believer in the anti-communist cause and was very bitter about the outcome of the war. A: I’m at the beginning stages of writing a proposal for a biography. I’d like to tell you and your readers the subject, but book proposals are such iffy propositions that always wait until I get a contract before spreading the word. A: I’ve had great reactions to the book, including from people who knew Barry Sadler, which is very rewarding. I am continuing working on marketing the book and welcome opportunities to talk and write about it. --Interview with Deborah Kalb. For a previous Q&A with Marc Leepson, please click here. This Q&A also appears on hauntinglegacy.com.